The combination of flavours in this dish is simply wonderful. It is one of my go to dishes when I’m eating at a food court – probably because I’m yet to locate a street food stall that makes it in our area. Conveniently the On Nut Tesco Lotus supermarket is just across the street from us and it has it’s own Food Court. It’s not the cheapest dish at the food court but well worth the few extra baht (60B), although you can get it cheaper at the Terminal 21 mall’s food court in Asok (45B). I still haven’t figured out what the proper name is in Thai – when I asked they told me it was Ba Mee Pet, which basically means Egg noodles and Duck (I thought it should surely be more complicated). 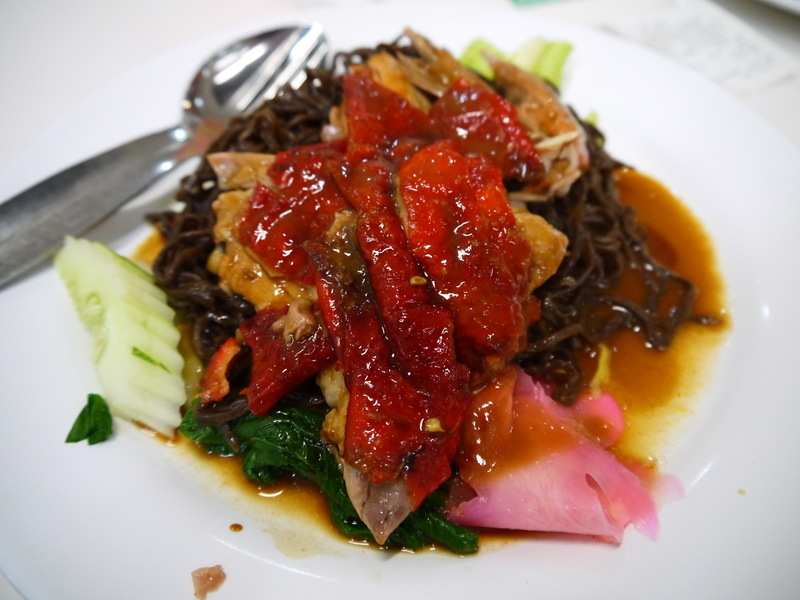 You get rich succulent roasted duck layered on top of dark sesame egg noodles. The noodles have been quickly cooked so they are al dente then a rich dark duck flavoured sauce is poured over the top. The dish is accompanied with pickled ginger to add a bit of zing, and balancing with the rich flavours of the duck and sauce. Some boiled greens and fresh sliced cucumber bring a little lightness too. I’ve made myself hungry writing this so I’m off to have lunch!